Once a website has been published, the creator does not have control over how the content is shared. 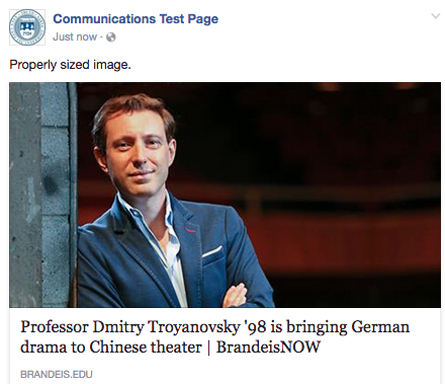 By uploading a social media image, web editors determine how a page's linked image, the thumbnail associated with links, will appear on Facebook. What is a Social Media Image? When someone shares a link on Facebook, Facebook will automatically pull the first image it finds on a page. 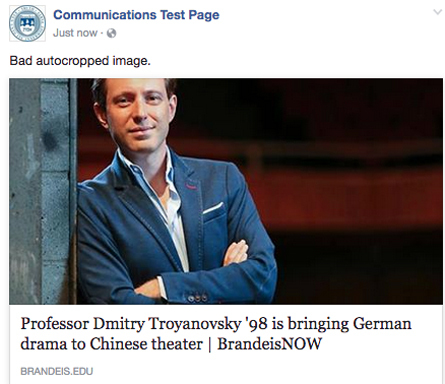 Even if the image is properly sized for the website, it may not automatically crop properly on Facebook. For instance, in the screenshot below Facebook cropped out part of the subject's head. If there is no image on the page at all, then no thumbnail image will appear. By uploading a properly sized image to the social media image field, web editors ensure that Facebook's thumbnail image appears as they prefer. In the image below, the subject's head is properly cropped. Find the page where you want to add the social media image and click Edit. In the Department Page area, locate the Social Media Image field. Select an image you have already uploaded to the CMS. This image should be properly sized to 1200px x 630px. Submit the page and publish it when you are ready. You will not see the image in the editor or on your page, but it will render properly when the link is shared on Facebook. Sometimes the image that you want does not pull through the first time. Don't panic! Facebook's "scrapers" do not always pick up the image the first time it is linked to on Facebook. If after you have uploaded the social media image, your linked image thumbnail still looks wrong, follow the following steps. Copy and paste the link that is appearing incorrectly into the field under "Sharing Debugger." Click Debug. Look for the example of how the Facebook linked image will appear. If it is correct, the link is ready to be copied into Facebook. If not, click Scrape Again. Request additional social media assistance from Allie Morse, digital content and social media specialist.